Ever wished you could have a special, one-of-a-kind bourbon bottle with your name and a personalized message? Thanks to Jim Beam, you may just get that chance. 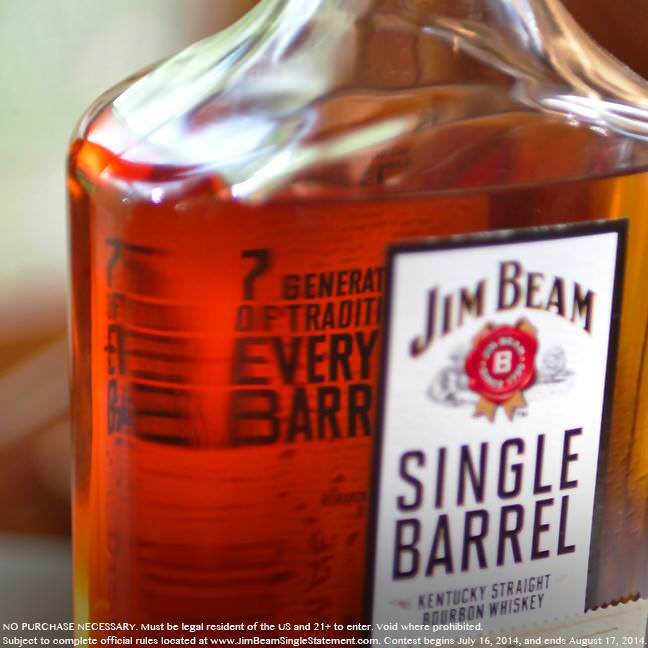 To commemorate the launch of Jim Beam® Single Barrel, the first-ever single barrel offering, the company is inviting U.S. fans to take part in the craft-making process with the “Single Barrel, Single Statement” Contest. To enter the contest, fans must submit a 50-character or less single statement that shares a taste of wisdom about enjoying a great glass of bourbon to a dedicated microsite through August 17th. The statement could be about the quality of the bourbon, the occasion, a toast, or a special place to enjoy a glass. The judging committee, led by Fred Noe, 7th Generation Master Distiller and the great-grandson of Jim Beam, will then select the six statements to be featured on the back label of actual bottles of Jim Beam Single Barrel. The special bottles will be sold in stores nationwide, alongside the statements of several Jim Beam craftspeople. So, what can we learn from this spirited contest? This is very impressive! When you have a product this exclusive, it offers a prime opportunity celebrate the exclusivity with a one-of-a-kind contest or experience for your customers. By offering bourbon enthusiasts the chance to co-create limited edition labels, Jim Beam is doing just this. As seen in the videos and other social media communications from Jim Beam, the company has a rich family history and commitment to working with craftspeople. These characteristics differentiate the company and showcase a more human, personal side of the brand. Look for opportunities to tell these stories via social media, such as what Jim Beam did with a series of YouTube videos featuring Fred Noe and other craftspeople sharing their stories about the company and new Single Barrel bourbon. Contests are often used to raise consumer awareness about a new product or initiative, but they can also be used to tell stories. Jim Beam is leveraging this contest to raise awareness for its new Single Barrel bourbon, but it’s also shining a spotlight on how its community enjoys a well-crafted bourbon. The company should mine these stories and look for opportunities to create inspiring visuals and/or videos to continue to the momentum and inspire continued storytelling and conversations.